Addressing Marketing Requirements such as branding, shelf space etc. Nothing can replace hands-on experience and expertise when it comes to packaging design in the food sector. If you’re supplier is already up-to-speed with the Regulations and the key considerations relevant to your requirements, it will save time and money. We’ll instantly know when corrugated cardboard is more appropriate than solid board and we can work with the customer to take into account the cost implications of the different choices of board. While stacking strength in a standard case is important, the customer may require easy handling facilities and we can integrate easy opening features and perforations where necessary. Truform has been in this business since 1967 and our in-house expertise enables us to design boxes that address any possible issues (with an emphasis on efficient manufacturing) – before they arise. When a manufacturing or assembly line goes down, it’s not pretty for those on the factory floor. So it’s vital that any flat bed or rotary die supplied is accurate and integrates seamlessly into the process. As a critical supplier to this process, we have experience with all major box manufacturing systems as this is a huge advantage when it comes to offering a comprehensive product based solution. Truform offers an after-sale service that goes well above and beyond the supply of packaging design and die cutting services and we will often visit a customer to offer relevant technical support where requested. This after sales service is one of our key strengths – as our customers testify. One of the developments in the Food sector over the last decade has been the requirement for shelf ready packaging. It goes without saying that the packaging designer will need to be thoroughly familiar with the relevant restrictions and common customer requirements in relation to shelf ready packaging. When it comes to the need for both Flat and Rotary Dies, a high level of accuracy is critical and Truform is probably second-to-none in terms of the quality of production and depth of expertise in this area. Our packaging design and die cutting services have been used in food packaging for global brands across Europe and further afield. 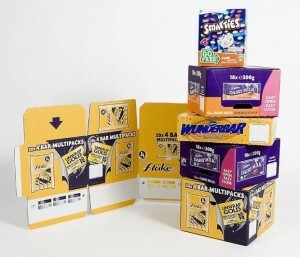 This expertise was assessed and confirm a number of years ago when we were appointed as the sole licensee and distributor for Container Graphics Corporation in Europe – a world leader in Die making for the corrugated box-making sector. If you are looking for an expert, reliable and proven supplier in this industry – call today to discuss your requirements. We look forward to hearing from you.